We were made “in the likeness of God.” But in course of time that image has become obscured, like a face on a very old portrait, dimmed with dust and dirt. To bring about this re-creation, Christ still comes to men and lives among them. In a special way he comes to his Church, his “body”, to show us what the “image of God” is really like. 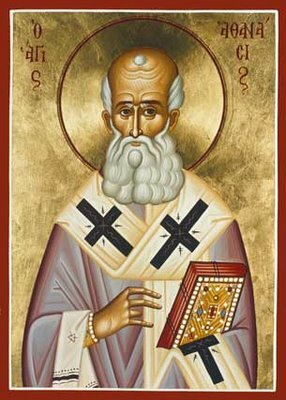 Last week we celebrated the feast day of St. Athanasius, who lived from around 296 A.D. until 373. He was the 20th bishop of Alexandria, which was a center of the Christian faith at that time. He fought against the Arian heresy, which suggested that God the Father created the Son (and thus called into question the co-equality of the Trinity) . Athanasius defended traditional trinitarian doctrine even when it required him to stand against other powerful bishops and two emperors. For a good while, he lived in exile, fleeing to seek shelter for a time with the Desert Fathers. His steadfast devotion to the Trinity despite political and religious opposition led to his nickname Athanasius Contra Mundum (Athanasius Against the World). The Roman Catholic Church considers him one of the four great Doctors of the Church, and the Eastern Orthodox Church regards him as one of the Great Doctors also. In the quotations above, St. Athanasius reminds us that although we were created in God’s image, that likeness had become marred over time. (I find this formulation much more sound, and more palatable than Calvin’s notion that we had fallen into “total depravity”.) He then suggests that the Incarnation of Jesus became necessary because we had strayed so far from God’s original likeness. God sent his Son, he argues, to restore creation to His original intent. But Athanasius argues the Incarnation didn’t end two thousand years ago, in fact he teaches that it hasn’t ended yet. He says, “To bring about this re-creation, Christ still comes to men and lives among them.” In prayer, in the eucharist, and in our love for each other, we still encounter the Living Christ. C.S. Lewis echoed this view when he wrote, “God became man to turn creatures into sons: not simply to produce better men of the old kind but to produce a new kind of man.” Through the mystery of the Incarnation, God calls his creation back to Himself. I think that’s what Jesus had in mind when He talked about His sheep, who know His voice. Athanasius then recognizes the wonderful and terrible burden on the Church. As the mystical body of Christ, the Church must make the Incarnate Christ visible to a troubled world. The Church must reveal Jesus and the Father to those who are “unwilling or unable” to recognize them otherwise. By drawing everyone to the Father and the Son (through the power of the Spirit), the Church participates in the re-creation of the world. Heaven help us if we’re not doing that. Heaven help us indeed. This entry was posted in Uncategorized and tagged Anglican, Bible, Disciple, C.S. Lewis, Christianity, Church, discipleship, Dominican Order, Ecclesiology, Episcopalian, Incarnation, Jesus, Religion, Salvation, Spirituality, St. Athanasius, Theology. Bookmark the permalink. A good reminder of why it is so important for each of us, as a member of the Church, to live our lives according to the Spirit’s leading. May the Christ in me see the Christ in you, today and always, Amen. Quote: “Through the mystery of the Incarnation, God calls his creation back to Himself.” I enjoy the biblical and and historical mix too. It’s an education! Great article brother James I will bookmark this! I’m glad you liked it. I suspected that somehow all that study of Church history might pay off someday (wry grin). You note: I find this formulation much more sound, and more palatable than Calvin’s notion that we had fallen into “total depravity”. I’m not sure what he had to say on the subject. It’s much easier for me to live with the notion that we had gone very, very far astray from God’s will. “Total depravity” comes to close to denying that any remnant of the goodness that God pronounced upon creation remains. Like my brother, Aquinas, I just cannot go that far. Oh, indeed, I greatly prefer the Irenaeus-Athanasius-Cyril-NeoChalcedonian trajectory to Calvinist total depravity! I like the image John Michael Talbot uses in his book The Music of Creation, that as the image of God we are mirrors, and Christ must come and clean the mirror so we can reflect God’s image properly. He cited a Catholic for the idea, but I forget who! I’ve clung to that ever since. May we always be mindful of our overt and covert needs to Love, Respect, and Personify our Heavenly Father and All His Creation to Each Other and Ourselves. I have never read of Athanasius before today and am thankful I was provided today’s reading of Him. Thank You for Your words Sir James. They do provide sound Inspiration to continue passing the Faith. God’s continued Blessings upon You and Your House………………. I’m glad you liked the post. Athanasius reminds of so much that’s important in our faith. I have now become a fan of St. Athanasius. I have a sneaking feeling that he’s a fan of yours, too.